Enjoy plenty of great Adirondack attractions and entertainment while staying at The Stone Lodge. Located on Loon Lake in the heart of the Adirondack Park in beautiful Chestertown, New York. There are always something fun to do while staying at The Stone Lodge! Seasonality plays into what’s available. Dining – be sure to stop in for lunch at The Main St Ice Cream Parlor which hosts a true “soda-fountain” delicious menu, gift shop and nostalgic feel which is rare to come by. For dinner try O.P. Frederick’s, good food, casual atmosphere on Loon Lake. Or pick up some treats for the grill.. Nettle Meadow Goat Farm and Cheese Company and Oscar’s Smokehouse in Warrensburg. After a hot day on the lake, stop by The Crossroads for soft-serve Ice Cream. The area offers numerous excellent dining options from fantastic tapas try The Bull House or wine bars like barVino in downtown North Creek. The area offers casual eateries & fine dining Friends Lake Inn. For great food after a busy day, at a fair price. Try the Black Mountain or Basil & Wicks. Shopping– enjoy shopping at the shops on Main Street- antiques, home decorations, and more! (favorites include Hudson River Trading Co, Rustic Charm Pottery and the Crossroads Outdoors & Gifts. For even more shopping either visit the outlets in Lake George, Bolton Landing or Saratoga Springs. Warrensburg, just 15 minutes south is famous for its many antique shops. Skiing and snowboarding at Gore Mountain – Less than 5 minute drive to the lifts. Gore Mountain boasts 2100’ vertical, 11 lifts, 75 trails and 95% snowmaking, Gore Mountain is a premier ski area of the northeast and just opened a new face of the mountain “Burnt Ridge” with a new quad chair and 4 new trails. The North Creek Ski Bowl also offers night skiing and tubing. Saratoga & North Creek Railway -enjoy a scenic ride on North Creek’s historic railway. This trip winds its way through the upper Hudson corridor. Once finished visit the Depot Museum. Whitewater Rafting – This annual pilgrimage begins early spring and continues through the fall. Three great rivers provide thrilling family trips and rafting adventures. Beaver Brook Outfitters and White Water Challengers. These guys specialize in the Hudson River and any conditions mother nature throws at us. Local Farmers Markets – The Chestertown Farmers Market, open Wednesdays from 10am-1pm; June 20th 2012 -Oct 10th 2012 and The North Creek Farmers Market open Thursdays 3pm-6pm; June 14th 2012 – Oct 4th 2012. Local Farms, Local Food, Local People. Museums and Galleries – The Adirondack Museum in Blue Mountain Lake is on the “not to be missed” list but numerous options abound. Open end of May-Late October. Another great museum is the Wild Center in Tupper Lake. Very science, hands on, walks you through “Where the wild world of the Adirondacks opens before your eyes”. Very cool. 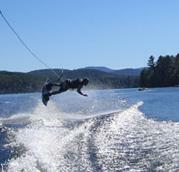 Water Ski or Wakeboard – The Inverted Wakeboard and Waterski School is located on beautiful Loon Lake, NY. They offer instruction for beginner through advanced. Whether you are learning to get up on two skis or learning to drop one or maybe trying your first roll on a wakeboard, they’ve got you covered. Scenic Drives -Take a road trip through spectacular scenery of the Gore Mountain Region or head north into the High Peaks. Our favorite drive is usually starting in North Creek-Indian Lake-Long Lake-Tupper Lake-Saranac Lake-Lake Placid-Keene-Keene Valley-Schroon Lake-Chestertown-Wevertown-Back to North Creek. Takes about 4 hours with a stop for lunch. Amazing in the fall. Rodeos – It might be hard to believe, but Warren County has a number of dude ranches and rodeos available www.1000acres.com, www.paintedponyrodeo.com, www.ridinhy.com. Hey – who doesn’t love a rodeo clown after a couple micro-brews? Horseback Riding – There are numerous options for horseback riding along a variety of scenic trails. Very close is Circle B Ranch www.circlebranch.net and Loon Lake Riding Stables 518-494-5168. Bird watching – Not exactly my cup of tea. There are so many beautiful birds just make the Adirondacks home. Each season brings a new flock or species. Its cool though, I can see how it could become ones hobby. For a free Adirondack birding map is offered at: www.adkbirds.com. Balloon Flights – many options available. Fly over the Glens Falls, Lake George area Call for telephone numbers. www.adirondackballoonflights.com. Lake George Village – From miniature golf, shopping, amusement parks, waterslide parks, mini golf and go-karts on beautiful 32-mile long Lake George , visit Lake George Village www.lakegeorge.com/things-to-do/. Saratoga – The famous horse racing flat track is open through all of August, but the magnificent city of Saratoga is fun to visit year round www.saratoga.com. Cross-country ski and snowshoe – Garnet Hill www.garnet-hill.com , Cunningham’s Ski Barn www.cunninghamsskibarn.com , and others including unlimited acres access on state land. We personally enjoy skiing up the old (unused in winter) railroad tracks or on the 20 acres immediately behind the cabin. Winter Horseback riding – Circle B Ranch www.circlebranch.net ! Sleigh ride sand hay rides are also available! Lake Placid – Only an hour or so away and home to two winter olympics. www.lakeplacid.com It’s a beautiful one-hour drive north. Window shop down Main Street, stop for lunch at any number of great lunch spots, go to the top of the ski jumps and watch the ski jumpers or ariel freestyle skiers practice or compete. Check out the luge or bobsledding going. For the adventurer, take a bobsled ride yourself…. www.mountvanhovenburg.com. Lots of places to stop and walk/hike at trail heads along the way!